The medical tricorder is now closer than ever to reality. A group of Berkeley engineers have invented a mobile phone microscope that can photograph microbes in your blood, and analyze them for disease. 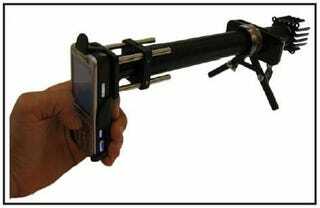 The research group, who published an article about their CellScope in today's edition of PLoS One, wanted to figure out a way for doctors in developing countries to diagnose common blood diseases in the field. They hit upon the idea of a smart phone microscope because parts for it have become cheap, and many developing regions have fairly good wireless networks for phones. Using a cheap phone attachment with an LED, the engineers feed magnified images into the cell phone camera. Software on the phone can analyze bacterial counts, or images can be sent via the cell network to labs for quick analysis. The same regions of the world that lack access to adequate health facilities are, paradoxically, well-served by mobile phone networks. We can take advantage of these mobile networks to bring low-cost, easy-to-use lab equipment out to more remote settings . . . We had to disabuse ourselves of the notion that we needed to spend many thousands on a mercury arc lamp and high-sensitivity camera to get a meaningful image. We found that a high-powered LED – which retails for just a few dollars – coupled with a typical camera phone could produce a clinical quality image sufficient for our goal of detecting in a field setting some of the most common diseases in the developing world. The team tested the CellScope with samples of infected blood and saliva. As you can see in the images below, the phone camera was able to capture clear images of Plasmodium falciparum, the parasite that causes malaria in humans, and sickle-shaped red blood cells (sickle cells are indicated with arrows). The team also took fluorescent images of Mycobacterium tuberculosis, the bacteria that causes TB in humans. Using software on the phone, researchers got an accurate TB cell count. The system could be used to help provide early warning of outbreaks by shortening the time needed to screen, diagnose and treat infectious diseases. This device is about to become an indispensible part of every field medic's kit.